Yesterday our high school class used Froebel gift number 4 to express various aspects of character. I had made several sets. They were given two minutes to come up with their designs, and then tried to determine what traits of character had been described in each other's arrangements of blocks. 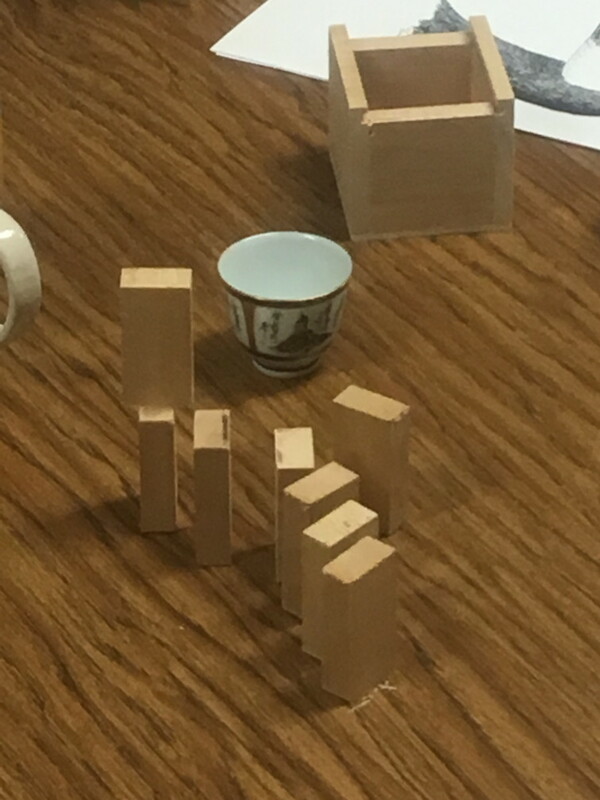 It was interesting to see the blocks used as communication tools at the high school level, as they are usually thought of as a Kindergarten toys. But placed on the table, the students had immediately begun building and arranging with them. Do we ever outgrow our need to play? Humans are by nature, designers. Yesterday was our first day of the new school year, and all the students were very excited and pleased to be back. My classes begin on Tuesday. Today I am working on the book chapter that concerns box making with kids. During our teacher in service training some of our teachers were intrigued by the use of Froebel's gifts 3 & 4 to convey emotions, as shown in the video of architecture students making and using the blocks at Miami University. One of our teachers came up with the idea of allowing the students to build what they feel. 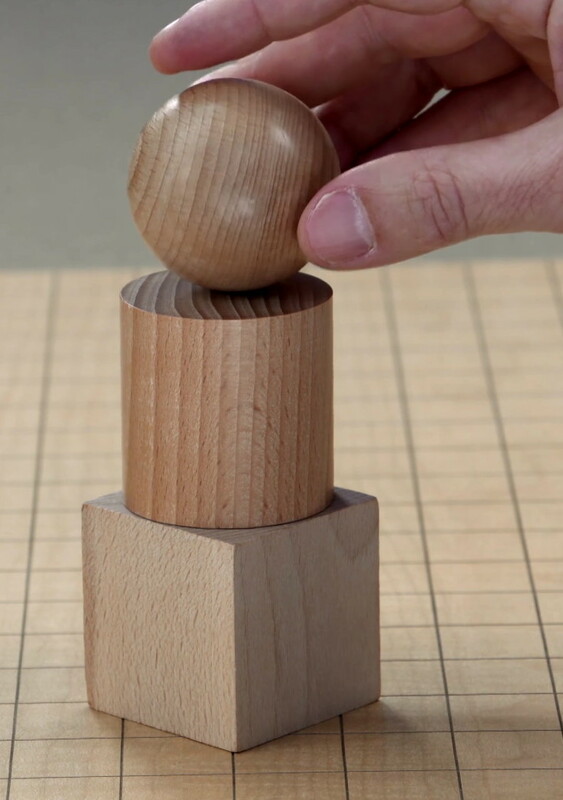 In the History of Kindergarten video, John Reynold's architecture students use the blocks to respond to word prompts, thus using arrangements of the blocks to convey various emotions. Our teachers decided that by allowing the students to express their feelings through blocks, the usual language block that makes it hard to describe what we feel, might fall away. Build it first, thus using the concrete to express the abstract. One of our students when asked to use the blocks from gift 4 to express fear, arranged them into a straight line separating one side from the other. Teacher interest led me to prepare a number of sets numbers 3 and 4 to share with various classes. They are roughly and quickly done and will improve with sanding. I made 13 number 4 gifts and 9 number 3. Make, fix, create and insist that others be allowed to learn likewise. the nutshell: Make it meaningful, make it real. The role (and the power) of the senses is to confirm the reality, the relevance, and the importance of learning. 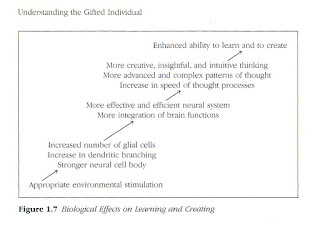 The chart is from Barbara Clark's book, Growing up Gifted and illustrates "how the effects of environmental stimulation strengthen the brain at the cellular level, leading to enhanced ability to learn and create." Recent research tells us that the children from rich parents perform better in education. That should come as no surprise. Their lives are often more deeply infused with experiences that are designed by their parents to offer a sense of mastery over the world that surrounds them. Education has traditionally had three purposes. One was to prepare the child for economic success. Another was to force the child into compliance with societal norms. The third was to prepare the child (and later the adult) to get along with others within communities: to grow as human beings in understanding of self. To focus on doing all three is a tall order, particularly if you've created a contrived system of learning virtually devoid of real, meaningful work. Work is a great way to bring the senses (all of them) into school. It develops skills that can become a source of both amusement and economic employment. It helps the child to understand societal norms and the value of all that surrounds us, and it provides a collaborative framework in which we work together in learning about ourselves. By making schooling artificial, it becomes trivial. By making it a means through which children may serve family and community through the crafting of useful beauty, it is by no means so trivial, artificial or abstract. I like engineering projects that allow me to use my skills. The 1st through 4th grade teachers had set up a reading loft between their classes. But how could the children get up in it? A ladder was called for. Things are made relatively easy when the tools, materials and skill are in place. Having skills in woodworking has allowed me to help my fellow teachers in preparing their classrooms for the return of our kids. I have been hearing from my adult students from this summer's classes. They have been making good use of what they learned. In the meantime, I've been sending off chapter text, photos and sidebars to my editors. Today I will be machining box parts in my wood shop, sending off more chapter text and photos for the current book project. This week the students return to Clear Spring School. A week from Tuesday students return to wood shop. Our Spanish teacher is wanting all the students to make shrines for a show in October, and I plan to make a couple prototypes for her to decorate so the students will have a better idea of what they will make. Then I'll prepare stock, ripping material to width so the students can build shrines of their own design. In my own wood shop I'm building 80 boxes. I'm machining lots of small parts to be ready for assembly. When my daughter was in high school, she had been recently elected as president of the student council, and had a short list of things she wanted to accomplish. She had been elected as a junior to a position that was usually won by a basketball playing senior boy. That, apparently, was a disappointment to some. She was cornered in a room by a teacher (not doubt thinking herself to have the best of intentions) and told what an embarrassment she was to her school and to her teachers. My daughter was brought to tears. I was furious that my daughter would be faced by such bullying by a teacher in her school. My daughter insisted that I stay out of it. She insisted it was a thing she could handle. She informed me that she would move on to better things, and she did. She has two masters degrees and teaches high school in New York. It is a real world out there folks. Children given strength in their other relationships can succeed despite the bullying that takes place in schools. But let's not hesitate to name what we see. The process of naming is the first step in building a better world and better schools at the same time. Whether bullying takes the form of holding a child's arms behind his back while you beat his chest, or closing the door of your office so that you can berate a child without the other staff members being aware, it's very much the same thing. 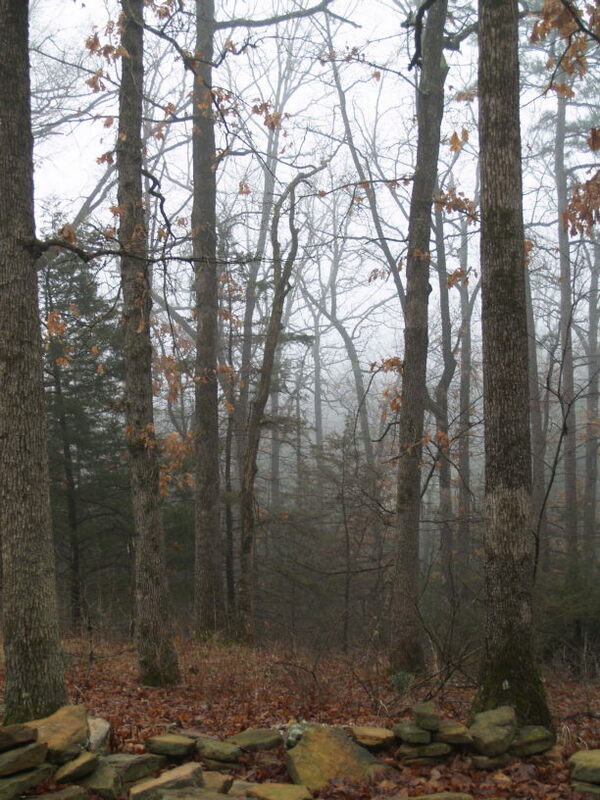 I chose the photo from my side yard because it offers serenity to a challenging subject. Schools claim to stand up against peer on peer bullying, but what happens when the institution itself is the bully? Am I completely off base to suggest such things? And can peer on peer bullying be simply a reflection of the ways children are treated by adults in schooling and in life? How often is the playground bully the one marginalized and controlled by teachers in the classroom, but told by his parents to stand up and defend himself? I suspect that is at least sometimes the case. It is an illness passed on between generations. I can give three examples. The first is the more classic case. In 4th grade on my first day in a new school, two larger boys held me by the arms and beat me in the chest. That's the kind of bullying that is easily recognized as bullying. A second event happened to me when I dared to challenge a teacher on the correct answer to a question on an analytic geometry test. On the next day he told students in the class previous to mine, "watch what happens to Stowe today." They warned me, so I was prepared for his wrath from the day before. Immediately after taking roll, he demanded, "Stowe go to the board." I immediately took chalk in hand and silently proceeded with my proof. He had intended to humiliate me, but the interchange had the opposite effect. As the formulas became clear in black and white (black boards were actually black in those days) the truth of my position was irrefutable. What was intended as an opportunity to correct me for my previous day's daring to question his authority in math, ended up with the teacher removing the question from the scoring of the test. I do not blame the teacher for bullying, but for a form of institutionalized bullying in which the teacher is overloaded, unfamiliar with the qualities and capacities of his or her students, and may lash out in frustration. Teachers are human beings, after all. In other words, he may have been a "good" teacher, managing to deliver the required lessons, and a bully at the same time. A third incident from my high school experience was when after a school assembly I was accused of having stolen a "Beatle wig." I was led into a room with three administrators who grilled me about something about which I knew absolutely nothing. Having no evidence they allowed me to go, but left me wondering how they could have suspected me of such a thing. To be fair, my high school had 900 graduating seniors from a total school population of over 3000 kids. Can you understand how school administrators would feel over their heads, charged with maintaining order and control, and while having no direct knowledge of their individual students, be put in the position of bullying their kids? There is a scene in the History of Kindergarten trailer in which a woman, in response to being called in for a conference about her child's behavior asked the teacher, "Do you even know my child?" Organized for the efficiency of delivery of lessons and for control of kids, many if not most public schools have become places in which children are institutionally bullied and their spirits purposely squashed to conform to the needs of the institution. Yesterday in the wood shop, I helped a friend with making a wooden shield, and milled parts for boxes. I was saddened to learn of the death of John McCain. I did not agree with McCain on many things, but he, unlike many politicians of this day, actually put country first. He had been an advocate for free elections and the removal of the influence from too much money. He was one who would work across party lines even when it became unpopular to do so. He was one of the few Republican Senators willing to stand up to Donald Trump, and was vilified and hated by the president for it. During his presidential campaign, when a woman claimed Obama was a "secret muslim" he refuted her contention. He was a man of character and honesty, unlike the blatant bully who currently occupies the White House. Perhaps it's fitting that children in schools be introduced to bullying at the earliest possible age so as to be prepared for politics in the US. And I'll ask all who read here to consider if that's what we want. If not, and I ask that we all choose not, then let's get busy and fix American education. School must not be just about learning reading and math. It must be also about working in collaboration and harmony using creativity to build a better life. Bullying whether peer on peer, or institutionalized in the structure of the school itself, does not belong. 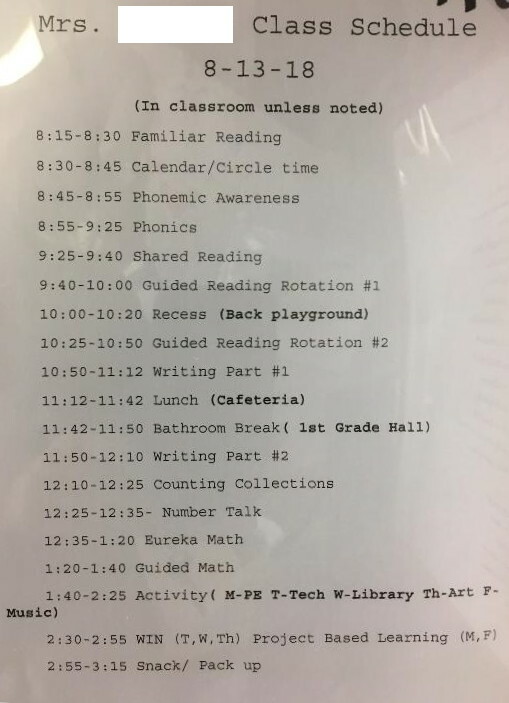 A friend of mine sent me a copy of a 2nd grade schedule from neighboring Berryville, Arkansas, which I share with you. I've removed the teacher's name, as generally teachers are not to blame for such things. Ask yourself whether 20 minutes of recess is reasonable for 2nd grade, or whether any child's life should be so tightly bound to a script or measured by worksheet. If the whole schedule is about reading and math, when do students learn about their community, the world and themselves? 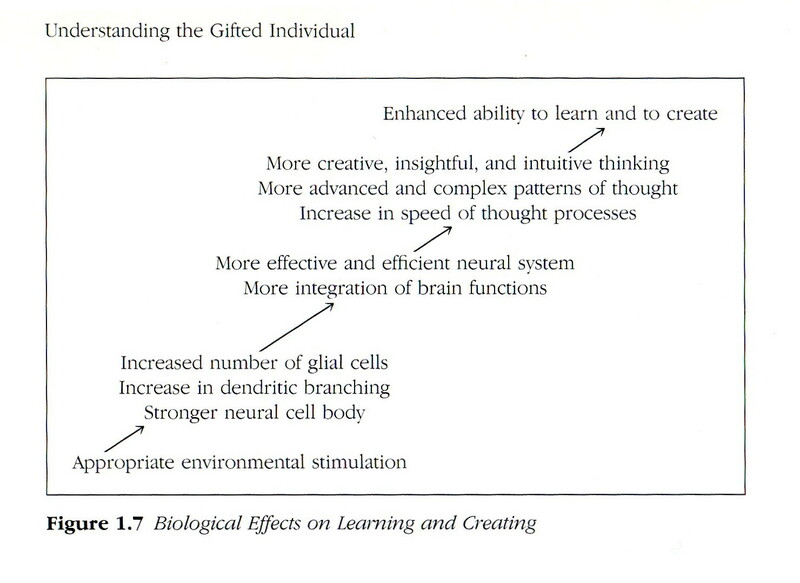 Can you understand why some students hate schooling right off the bat? 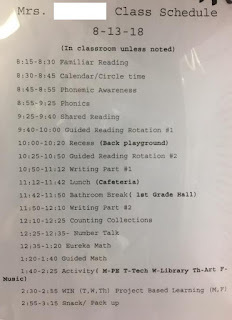 I was shown a copy of the Kindergarten schedule as well, and it too, showed only 20 minutes of unscripted time. I do not blame the teachers for this. They are held to unreasonable and destructive standards that they often know to be wrong. 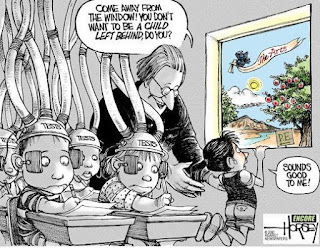 Knowing the damage this does to children, perhaps teachers will at some point rise up, though it is more likely that they will leave (as they have done in large numbers) their professions in despair. I have hopes that the Kindergarten documentary series will help awaken parents to the wrongs of American education. The following is from the Danish National Library Authority. The Finnish brain researcher, Matti Bergström concentrates on the child’s inner life and its – as we see it – chaotic ’possibility space’. Professor Bergström maintains that it is not only a question of ’white games’. The white games are our pedagogical efforts trying to bring up children in our own image. But there must also be room for the ’black games’ where children test themselves and the world around them.They must be given space. At a recent conference, Matti Bergström posed the question: do children need a knowledge lift? His answer was no, they need a chaos lift. We must allow children space and opportunity for the black games which are created in the unorganized and unsupervised meeting with other children. Make, fix, create, and accelerate learning by doing real things. seeing schooling through a child's eyes. This is an excellent blog post on education week: http://blogs.edweek.org/edweek/civic_mission/2013/03/_seeing_curriculum_through_a_childs_eyes.html The post describes a man's daughter (who attends what is thought to be a good school) watching a video Making it Real at Mission Hill. The daughter, mesmerized, wondered what it would be like to attend a really good school in which every child found their interests served through doing real things. Is it not fair to wonder why Americans cheap out, when it comes to the education of our kids? We could do so much better than we do. Today I begin preparing materials and projects for next week's start of school. I am also making 80 boxes for the Chancellor at the University of Arkansas to be used as gifts. Those at the moment are in the form of resawn walnut stock on the floor of my wood shop. Thickness planing will come next. Make, fix, and create. 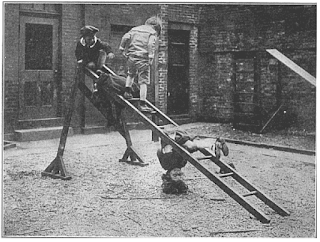 When children are allowed to do real things, all their senses and attentions are engaged, and tests are not needed to measure their performance. In this week's teacher training at the Clear Spring School, Scott Bultman's promotional video for the History of Kindergarten series was an excellent tool for stimulating 3 days of discussing school theory and pointing out where the Clear Spring School fits into the process of education reform. I look forward to the day when the documentary project is released for broadcast and you can see more of it. I am beginning to turn over materials from my woodworking with kids book to the editors for their work to begin. The publication date is being set tentatively for between April and June, 2019. 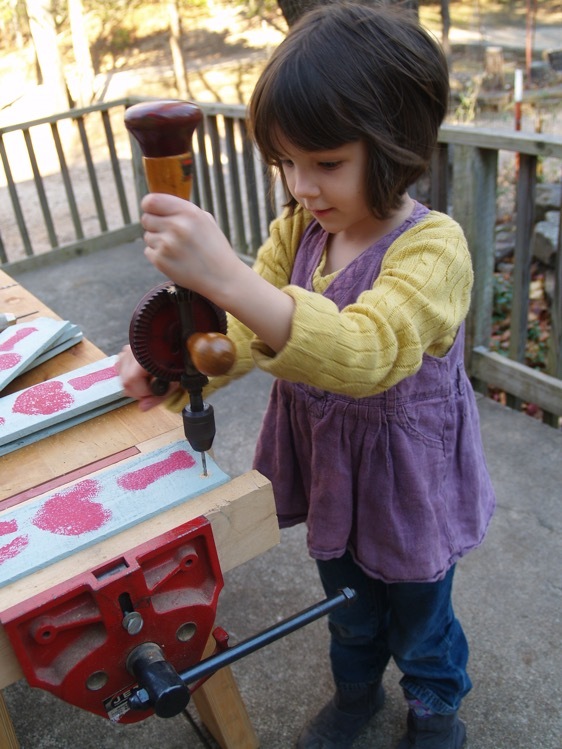 Our working title is The Wisdom of the Hands Guide to Woodworking with Kids. It is long but fits. Sometimes things do not go quite as we plan. McKenzie, after this first mistake, went on to make a perfect box. Her first. In teacher inservice we are making Froebel gifts just as folks in small villages would have done to put Kindergarten learning in the hands of their kids. I've prepared the stock for the teachers to assemble. Rigdon made gifts number 3 and 4 as shown. I had an anxiety dream last night in which we were trying to make a presentation to a very large audience in which everyone was talking and disruptive. Folks began leaving in large numbers before we got to the good part in which we were going to introduce the guests from A+ Schools. When it comes to education reform in the US, there's a lot of anger, (and reason for it) and when it comes to what we want to provide for our children, there's reason for impatience. The formula is actually quite simple, however. Children have the growing capacity to do real things in benefit to their families and communities. These real things involve the arts. Through the arts one can learn everything from music to medicine, from math to architecture, and to care for each other. Make, fix, create, and assist us in reshaping American education. Yesterday at Clear Spring School, I shared the first part of a promotional video on the History of Kindergarten with my fellow teachers. 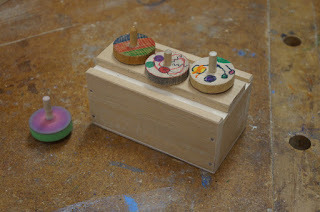 We then retired to the school's wood shop to make Froebel's gifts, 3 and 4. Since the password protected video is over an hour long I've broken it into three viewings to allow time for discussion and for us to discuss other things having to do with the start of the school year. The point is that we learn best through guided play and that even at the upper grade levels, maintaining a excitement for learning is a valuable classroom resource. 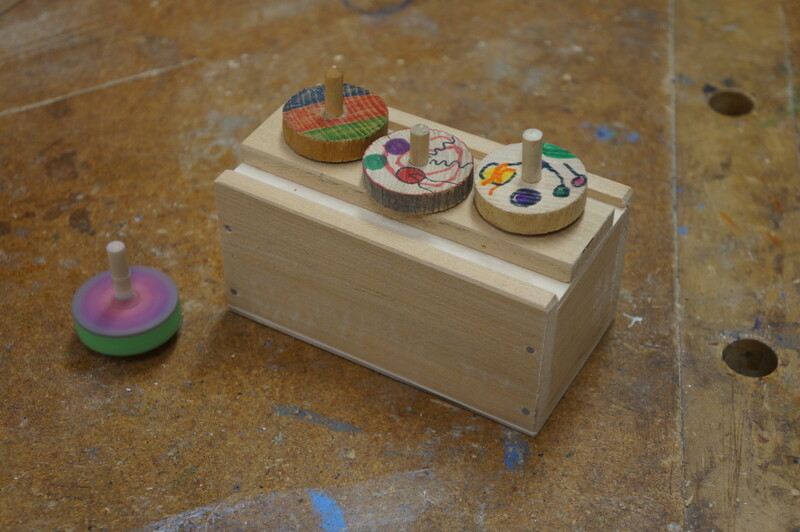 Gift number 2 as shown, consisting of a cube, a cylinder, and a sphere, each having different characteristics in how they behave when manipulated by hand, has become the symbol of Froebel and his method of learning. If you change the order of stacking, placing the cylinder on the lower level, then the cube and sphere, you get the shape Froebel referred to in his letters as "the doll," a thing that Froebel preferred teachers not demonstrate. Children should first and foremost be allowed to discover things for themselves. The image is a screenshot from the documentary film. Rudy Giuliani, in defense of Trump has claimed that for Trump to testify before the Mueller investigation would be for him to enter a "perjury trap." You can only be caught in a lie if you've been lying. But Giuliani claims further that "the truth is not the truth." What that means, only his kind of lawyer might pretend to know. Perhaps with that in mind Giuliani (and Trump) can just make things up and call them truth so as to create an alternative universe of mis-shapen reality. If enough folks can be convinced we will have completely lost our way as a nation of truth, of facts and of laws. To Plato and Giuliani, I offer William James' rejoinder: "Philosophy lives in words, but truth and fact well up into our lives in ways that exceed verbal formulation. There is in the living act of perception always something that glimmers and twinkles and will not be caught, and for which reflection comes too late." – William James. Today in the wood shop at Clear Spring School we will begin fall in service training with a study of Kindergarten and making Froebel's gifts. The following is from Charles H. Hamm. The human hand is constantly seeking the truth and finding it. 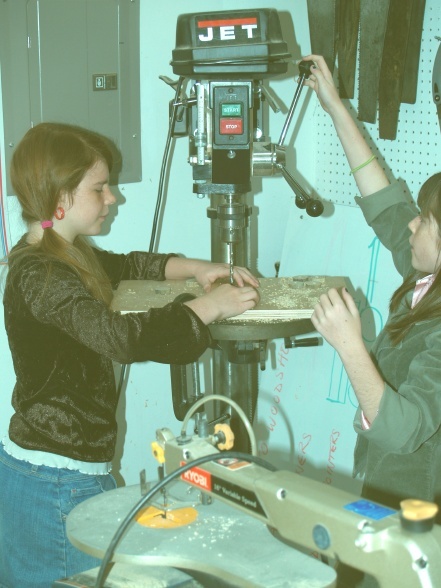 By leaving laboratory science and wood shop and the arts outside of education, we have diminished our children in both character and intellect, and sacrificed our human culture on the altar of foolishness and stupidity. For some reason Giuliani seems to have missed one of the essential lessons to be found in wood shop. Truth is truth. I have been working on the chapter of my woodworking with kids book that is about box making. It is a rich subject area. If you can make a box, you can make most other things from wood. Boxes invite precision. If you try to assemble one in which the parts are not cut square or to proper length, the failings are obvious and at hand without the teacher being required to critique the work. Reality is impartial. It affects even those who have been selected by society to find only ease. The sliding top box in the photo shows how a box can hold objects, and also offer a means for displaying related objects. The small top at left is spinning to show the way colors blend when in motion. Make, fix, and create. Assist others in learning and playing likewise. I added an edge guide to my 1/8 in. 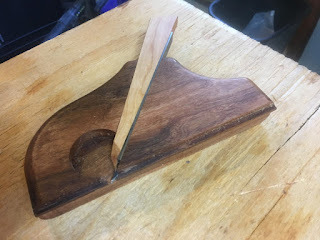 rabbeting plane so that it will cut a groove a precise depth and distance from the edge of a board. This is a special purpose tool (designed and made myself) to use in making sliding top boxes of the type used to contain Froebel's gifts. The groove is required for the lid to slide in opening the box. On Monday, my fellow teachers at the Clear Spring School will exercise their hands, minds and tools in a learning and sharing time having to do with Kindergarten and the extension of play into the upper grades. This tool is one that we will put to use. Make, fix, create and adjust schooling so that others play likewise. 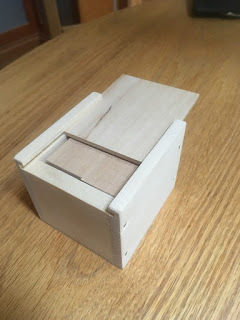 I am making some sliding lid boxes, and wanted to be able to use a small 1/8 in. 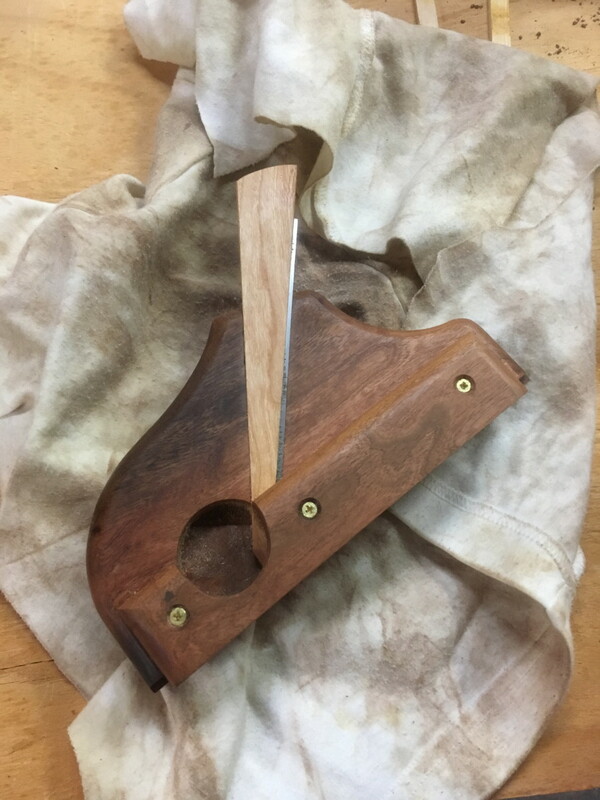 rabbet plane to cut grooves where the sliding lids will fit. I could try to find one to buy, or make it myself. I chose the latter solution, as shown. I tested it. It works. I may add an edge guide next. In the meantime, we are inching toward the start of school. New York Governor Cuomo got in trouble for saying America is not quite so great as we think we are. But what's the truth here? 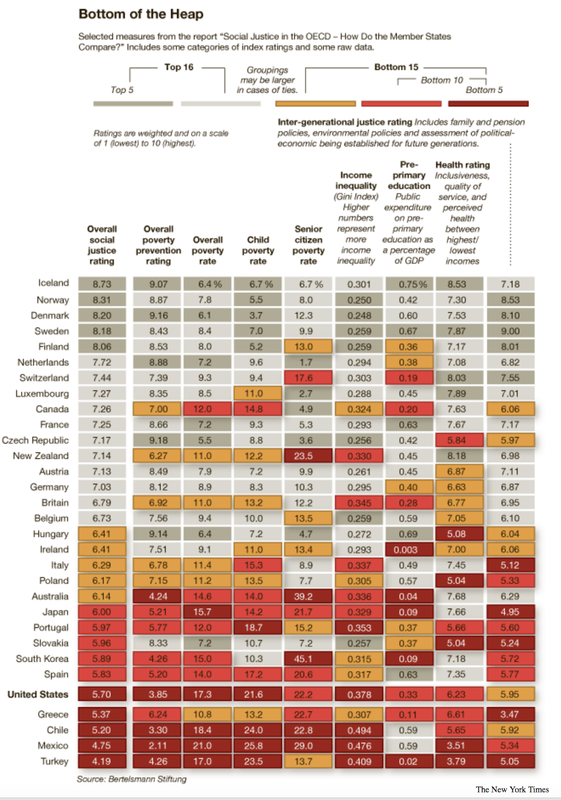 You might be interested in where the US stands in relation to other developed nations. We think of the US as being the "greatest nation on earth." We have the missiles to prove it. But we are deficient in a number of the most important ways. How do we care for our people? https://archive.nytimes.com/www.nytimes.com/imagepages/2011/10/29/opinion/29blow-ch.html Education is one. My wife and I will visit Helsinki in September and I'm attempting to gain an opportunity to visit a Finnish School as a way of highlighting their educational success story. Visiting schools in Finland is a popular pastime and a small industry of sorts. A tour can be expensive and only touch on the surface of things. So I do not know how successful I'll be in gaining the insight I hope to attain. 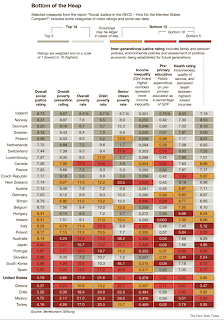 In any case, this chart from the New York Times in 2011 shows our standing. You'll find the US portrayed in red. At the Clear Spring School classrooms are in disarray as teachers try to prepare for students to return on August 26-30 for conferences and classes. Yesterday I shipped the Governor's award bases for Arkansas Quality, and today I will return attention to my book on training teachers, parents and grandparents to do woodworking with kids. Make, fix, create, and assist in building a more reasonable, equitable and just society in the US. It may take decades to do so. Today I am to proceed with clean up and planning for the school year in my classroom at the Clear Spring School. Next week I'll lead a portion of our school teacher inservice. I will begin with a preview of portions of the History of Kindergarten film project, and then we will do a work-together woodworking project, making gifts 3 and 4 from wood to be used in various classrooms. 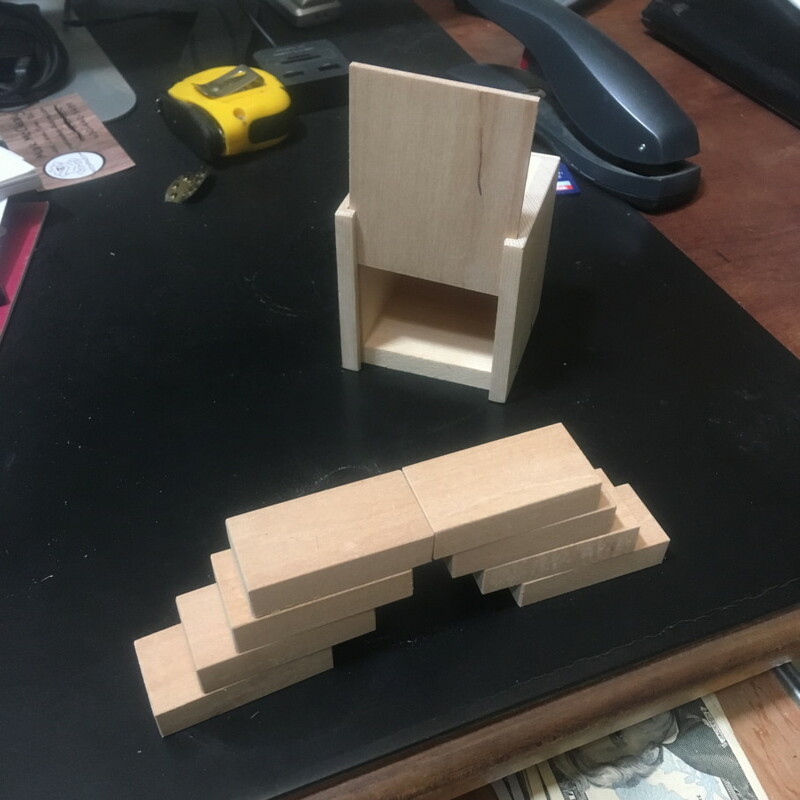 (boxes and blocks as shown) I hope to lead a discussion among staff of the importance of play, and some of Froebel's concepts, to give an overview of his philosophy and help our teachers understand how it fits our classrooms, today. When my wife Jean and I were in Trondheim, Norway we visited the folk museum in which Kindergarten gifts were treasured and displayed as an important part of their heritage. Those gifts were made by craftsmen in the community for student use, shaping the character and intelligence of their kids. Perhaps with some further explanation, and with your help in sharing the story, we will return to education that values play and uses the child's natural inclination to learn and grow. In my woodshop today I'll assemble the Arkansas Governor's Awards for Quality and prepare them for shipping. Make, fix, create and insist that others have the chance to learn likewise. 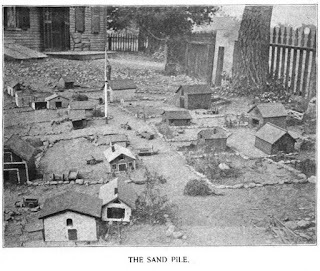 "On the whole, the “sand-pile” has, in the opinion of the parents, been of about as much yearly educational value to the boys as the eight months of school. Very many problems that puzzle older brains have been met in simpler terms, and solved wisely and well. The spirit and habit of active, and even prying observation has been greatly quickened. Industrial processes, institutions, and methods of administration and organization have been appropriated and put into practice. The boys have grown more companionable and rational, learned many a lesson of self control, and developed a spirit of self-help. The parents have been enabled to control indirectly, the associations of their boys, and, in a very mixed boy-community, to have them, in a measure, under observation without in the least restricting their freedom. The habit of loafing, and the evils that attend it, has been avoided, a strong practical and even industrial bent has been given to their development, and much social morality has been taught in the often complicated modus vivendi with others that has been evolved. Finally, this may perhaps be called one illustration of the education, according to nature we so often hear and speak of. Each element in this vast variety of interests is an organic part of a comprehensive whole, compared with which the concentrative methodic unities of Ziller seem artificial, and, as Bacon said of scholastic methods, very inadequate to subtility of nature." And so, my friends, here we have it. The father of the standardized testing movement, G. Stanley Hall, describing what education should be and could be if we were to dispense with the stupidity of our current methodology in which disciplines are divided and championed as though they are separate from each other. Hall wrote further on this point. Had the elements of all the subjects involved in the “sand-pile,” industrial, administrative, moral, geographical, mathematical, etc., been taught separately and as mere school exercises, the result would have been worry, waste, and chaos. And so we have it. Worry, waste, chaos, willingly accepted by parents and teachers who have no knowledge that other alternatives exist. It is the externally imposed artificiality of education that kills its spirit. As you can see, what the boys created was no ordinary sand pile. It was a microcosm of their own community in which they would learn according to their own inclinations.What we must remember is that children are hard wired for learning. It's what they do, so it needs not be forced, but can be gently directed. Play is the means to do so. 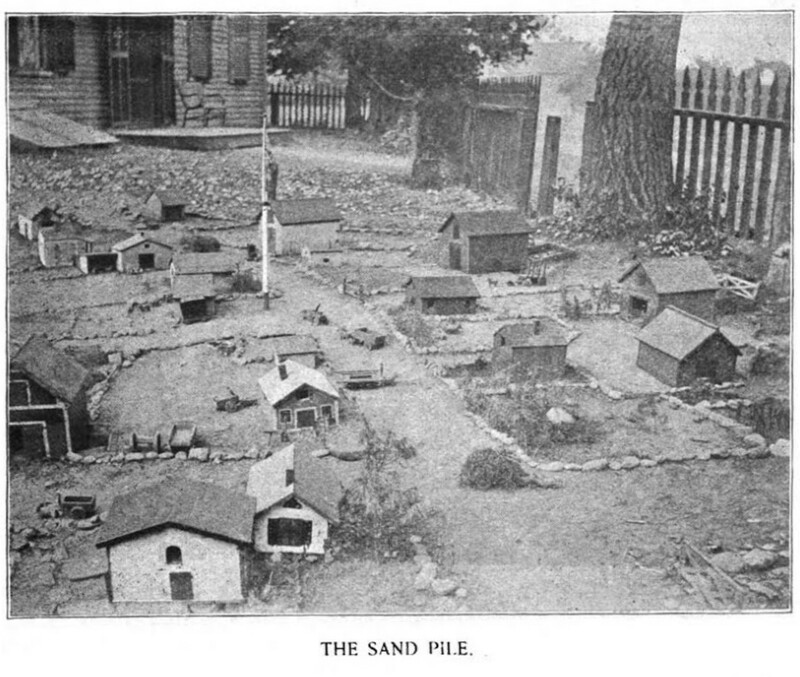 I had thought of G. Stanley Hall as being rigid and authoritarian, so finding "The Story of a Sand Pile" has been a surprise to me. Make, fix, create, and allow for the possibility that others will prefer learning likewise. Hall's book reminds me of when a huge pile of playground gravel was delivered to the Clear Spring School playground and the students had an immense amount of fun before tractors and shovels were brought in and distributed it across the yard. What can be more engaging than a hill of loose gravel to climb. "Here is perfect mental sanity and unity, but with more variety than in the most heterogeneous and soul-disintegrating school-curriculum. The unity of all the diverse interests and activities of the “ sand—pile ” is, as it always is, ideal. There is nothing so practical in education as the ideal, nor so ideal as the practical. This means not less that brain work and hand work should go together than that the general and special must help each other in order to produce the best results. As boys are quickened by the imagination to realize their conceptions of adult life, so men are best stimulated to greatest efforts by striving to realize the highest human ideals, whether those actualized in the lives of the best men, the best pages of history, or the highest legitimate, though yet unrealized, ideals of tradition and the future." The point is, of course, to play, for it is through play that we learn best. The photo is one from Jean Lee Hunt's Catalog of Play Equipment, 1918 and shows the Teacher's College experimental playground in New York. Make, fix and create... assist others in playing likewise. One of the things I noticed in my summer adult classes is that often students may want their teacher (me) to do their observing for them. They want to know, "Why doesn't this joint pull together?" The answer is usually obvious to me. A bottom or top panel may be too long, or too wide or the grooves joining them may not be cut to a consistent depth. In finger jointed boxes, the spaces between the fingers may not all have been cut to an equal depth. In making a box, there are always just a few things that can be wrong. And with some experience, and guidance, most problems can be solved through attention to: 1. careful measuring and set up to make cuts. 2. a firm and consistent grip as parts are guided through operations, and 3. the removal of waste sawdust or wood chips that can get in the way of parts being in position for consistent cuts. So I generally look for three things. Knowing what those things are can help me in getting my students to observe those same three things for themselves and solve their own box making problems. In a video, https://www.finewoodworking.com/2018/07/16/two-fixes-for-bandsaw-drift Michael Fortune shows how to tune a bandsaw to avoid "drift". He's simplified things in 3 steps. One is to center the blade on the upper wheel. The second is to make sure the fence is aligned with the miter gauge slot. The third is to make sure the table is aligned square to the cut so the miter gauge slot will be aligned to the direction of cut. Of course, all that's not as easy as it sounds. One must first become an observer and learn to trust what one sees and one's own skills of interpretation and discernment. Those are things students learn by doing real things in school, things you will not get from a book. My students tell me, "It looked easy when you did it." Adding some practice, it will be easy for them also. I've begun using Sam Maloof's formula to finish the Arkansas Governor's Quality Award bases, and a few incidental boxes as well. 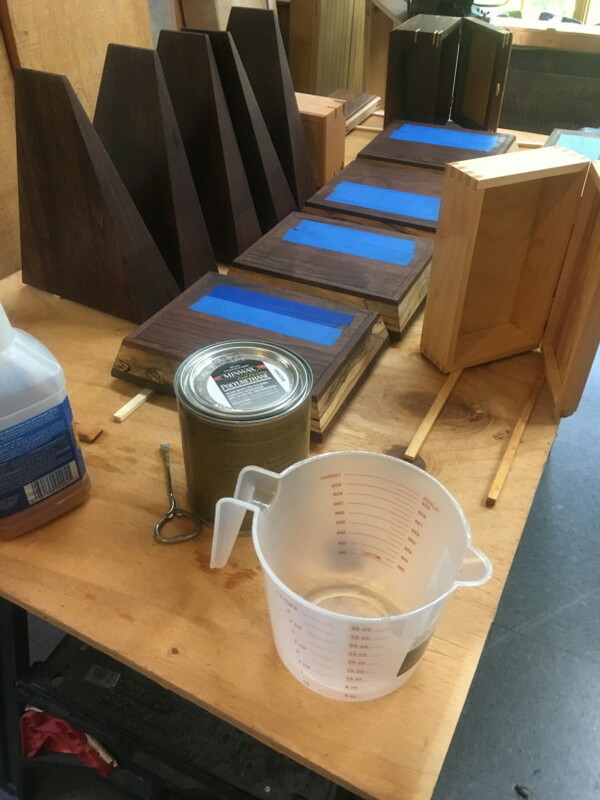 When applying an oil finish, it makes sense to apply it to a number of items in the same batch just to improve the efficiency and timing. The finish must be allowed to dry a bit before being rubbed with a dry cloth. So I try to finish enough product at the same time so that when all have finish applied, the first finished will be ready for rubbing at that time. The secret to mixing Sam Maloof's formula is shown in the photo. The one quart measuring cup. You don't need to mix whole gallons or quarts at once. A one quart measuring cup allows the formula to be mixed up in 3 cup batches as needed. This way the formula remains fresh. I use one cup each of urethane finish, mineral spirits and boiled linseed oil, using the lines on the cup to measure the amounts of each added. The ingredients are relatively inexpensive, and locally available. This is a penetrating finish that soaks into the depths of the wood to awaken full color but also builds up to a slight gloss on the surface of the wood. The urethane adds its protective qualities. At least two coats are required. I am also working on a new hinging machine for barbed hinges and planning for the coming school year at the Clear Spring School. The danger of one size fits all. If you are shopping for shoes, you know that not all sizes fit. In fact, most will not. But if you are planning for your children to be successful in their lives, do you plan for them to go to college and then express disappointment and condemn them as failures if they do not? Is successful completion of college the only measure of their success? Or may we allow our children to find their own internal motivations, their own successes and allow for them to find joy in their lives and in service to others regardless of whatever academic hurdles they choose to tackle or not? For many years, TV advertisements have made the point that those who achieve higher degrees from colleges and universities have higher lifetime earnings. But I wonder what the the balance would be if the time and expenditure for colleges and universities were taken into consideration. How much was paid by dropouts for uncompleted degrees? How would we take into consideration all the false starts, changed majors and careers that take off in vastly different directions? Most parents have things in mind that they hope their children will do or become. And we wish success to each. Under most circumstances we wish greater success to our own children. But we can create a society in which all those who make contributions to the success of human culture are afforded dignity and respect. And why not? What we need is a general education for all children (even those destined for college) that's infused with the character and intelligence that the engagement of the hands, doing real things, can provide. That education should allow for the diverse interests of each child rather than forcing all children to comply with uniform standards. Then we need to reshape society so that the super rich are more fully cognizant of their own debts to society and the labors upon which they stand. If you have a class of persons who've never made diddly squat, or attempted to gain skill in the practical arts, how will they then act to sustain the dignity and value of others in their communities... Those who may have had no choice but to engage in the practical arts? Yesterday I attended studio stroll at ESSA and saw wonderful tables the students had made in Steve Palmer's furniture design class. Each table was unique. Each was a reflection of the student's interests and intended use. In the German language, knowledge is described in two forms, Wissenshaft, and Kentniss. Wissenshaft refers to knowledge passed along, accumulated and expressed second hand and Kentniss refers to knowledge gained directly through experience. If you have any practical experience in the real world and have gained skill as a result, you may know the difference between the two, and the way in which one reinforces the other. Field Marshall Rommel was an example of a general who had both. 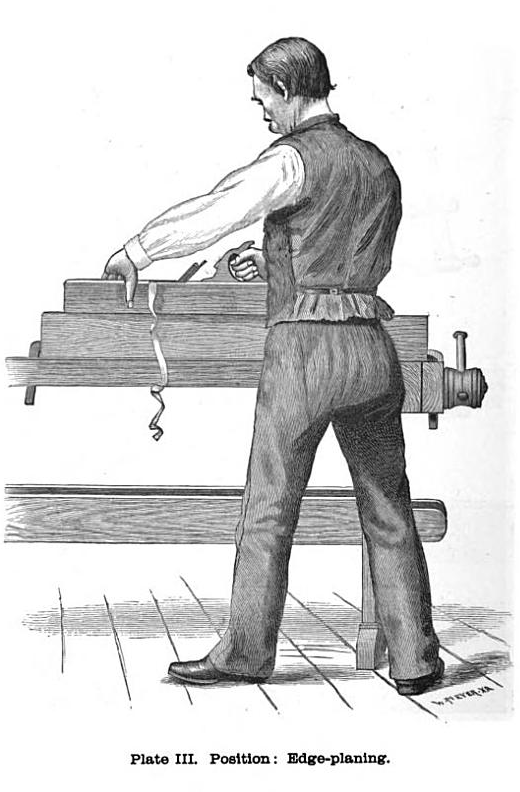 He was described as having fingerspitzengefühl, knowledge in the tips of his fingers, that would come from a practical combination of Wissenshaft and Kentniss. Through the last forty years of American education, the assumption was made that only those children going to college would gain success. This was good for American colleges and universities. It allowed tuition to sky rocket to the point that students, upon graduation, are often encumbered with massive debt, a large proportion of which is for uncompleted studies. Even many of those receiving degrees (like myself) did not take jobs in their fields of study. This does not mean that all college is a waste. But I would like to suggest that it may be a successful hornswaggle in too many cases. What in the hell is the matter with plumbing and other services that benefit our communities and families? Why are we, as a nation, unwilling to acknowledge the importance of the trades. And perhaps the more important question is why do we put academics on a lofty pedestal, and place such high regard on the artificiality of academic degrees? I demand that we rethink our priorities. 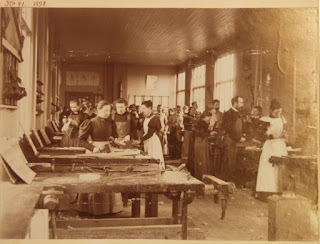 Universal woodworking education in schools was proposed as a means to foster a sense of the dignity of all labor and create conditions in which the barrier of harsh judgement between classes would be eliminated. The great stupidity of American education is that policy makers have no sense of the importance of that. Instead, schools have been made a sorting procedure, pushing students toward college rather than preparing them for real life. When LeBron James said a few things insulting President Trump's rude behavior and destructive policies, conservative talking head Laura Ingraham told him derisively, "shut up and dribble," making her point that athletes and folks like them have no place in politics, where smart mouths like her's should hold sway. LeBron James has taken her insult and turned it backwards as the title for a new Showtime series. His point apparently in using that title is that talking heads might learn a thing or two from engagement in the real world. Many intellectuals make the wrongful and destructive assumption that those who have invested time and energy in developing skills of hand, body and mind in the real world will not have cultivated their finer intellectual capacities like those one might find in a book. My point is that doing things in the real world becomes an enhancement and stimulant to intellectual capacity. It also has profound effect on character. for instance, compare Laura Ingraham's contributions to her community (what has she done? ), with what LeBron James is doing for the children of Chicago and Akron. I had a great visit with cousins yesterday, and will settle into the wood shop for a day of pleasure crafting things from wood. That I'm using my hands does not make me stupid in other things. The reverse may be true. how things get passed along. My own involvement in the Eureka Springs School of the Arts as one of the founders of the organization came as a result of my uncle Ron's involvement in Arrowmont, a school in East Tennessee that Ron and his wife Louise attended for years as I was busy launching my career as a woodworker and attempting to learn what I now do and teach today. They would tell me about their attendance at Arrowmont, and that gave me the idea that we needed a school of that type here in Eureka Springs. This is ESSA's twentieth year, and today I'll take my uncle Ron's three sons and their wives on a tour of the facility their father and mother in a rather direct way helped to launch. This is an illustration of how things get passed along and a thing you can do in your own life and in your own community. No craftsman is an island unto himself. I use the word craftsman while insisting that the term is not gender specific. It takes a community to make one. Even if you are not one or choose not to be one, there are ways you can play a part. One simple way is to support craftsmanship and woodworking as a thing children learn to do in school. 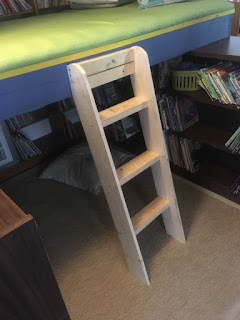 Another simple way is to support craftsmanship and woodworking as a thing adults do in school. We are by nature, lifelong learners. This week Steve Palmer is teaching furniture design at ESSA. I am back at work today following a week of vacation and my series of summer classes. I'm also in the process of planning for next year's summer classes, as that schedule must be set in time for various school catalogs to be published. My dates for Marc Adams School have already been set, June 10-15. 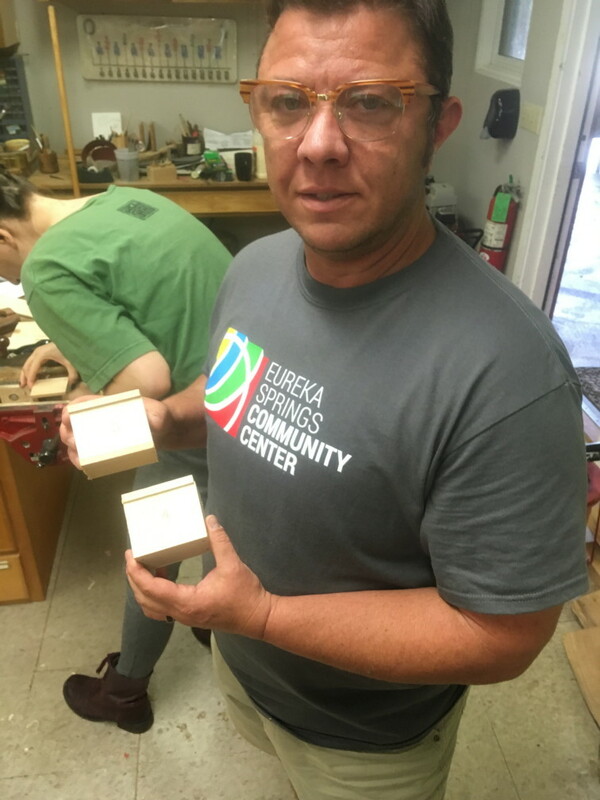 In my wood shop, I'm cleaning and working on Arkansas Quality Awards. At Clear Spring School, I will be doing deep cleaning in preparation for another year of classes, K-12. My drawing above is simple. 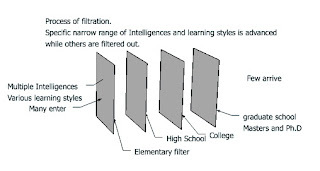 It shows a series of filters that exist between various levels of education. Those are promoted who fit a particular style of learning. If you are good at taking notes, and repeating what you have been taught you might pass through to the highest levels. 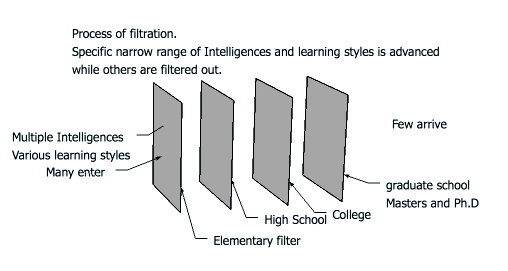 Each filter in order from left to right has a finer mesh removing non-academic style learners from advancement to positions of power and influence in education. To fix this problem some educational theorists have prescribed designing prescriptive lesson plans with bits and pieces of this and that to meet the various learning styles of specific students. For instance Johnny may be an auditory learner, so we'd best throw in a bit of music for the boy. The far simpler approach is to do things that are real and of service to the community. Woodworking, for instance, utilizes the whole person, thus every learning style is available to be expressed at the same time. Make, fix, create, and allow for others to learn as we do best. 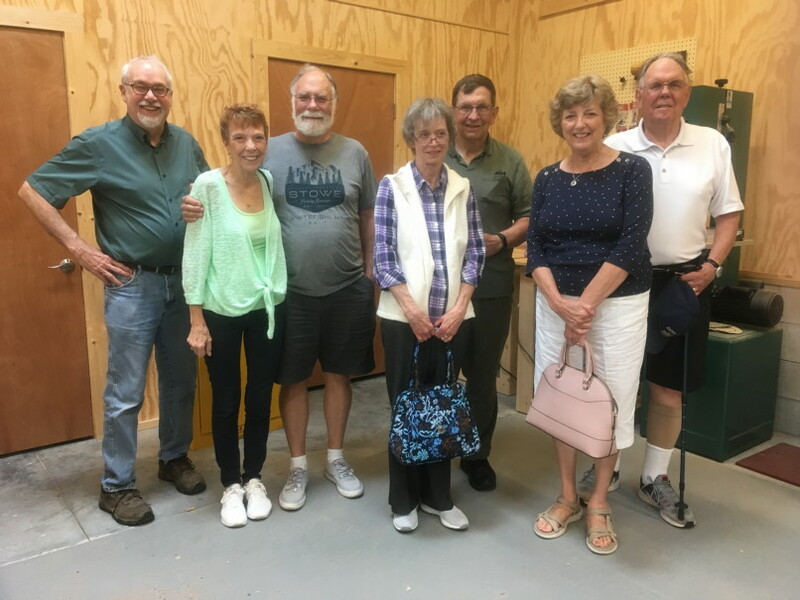 One fine thing during my class at Marc Adams School of Woodworking was to gather with my fellow instructors on the porch of the instructor lodging that was introduced this year. In the past we stayed in a hotel 15 minutes away. The new house purchased and remodeled for school use provides lodging for 4 instructors and puts them in association with each other. This year my fellow teachers were Steve Latta, Mary May and Sari Robinson. In the evening we sat on the porch, watching the sun go down over a field of elephant-eye-high corn, as we checked email on our mac laptops and talked about miscellaneous stuff. It is a meaningful thing to share time in fellowship with high level, dedicated teachers of the woodworking art. One of our plans at ESSA is to provide instructor lodging that connects teachers in collaboration with each other. The idea is to build 4 small duplex efficiency units housing up to 8 teachers at a time. My initial plans are ready to turn over to our architect for refinement. Make, fix, create and assist in providing means for others to learn likewise. You can depend on what a keen cutting tool can do. 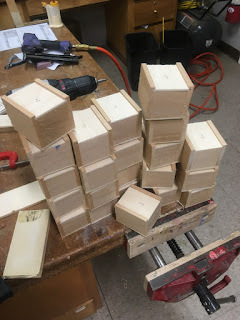 Today my wife and I arrived home from visiting family in Denver, and my shop is a mess after teaching at Marc Adams School of Woodworking and the Connecticut Valley School of Woodworking, each week-long classes in Box Making. I have several projects in the works in my shop that were put on hold as I traveled and taught. Now I need to buckle down and get ready for a resumption of classes at the Clear Spring School. Make, fix, create. 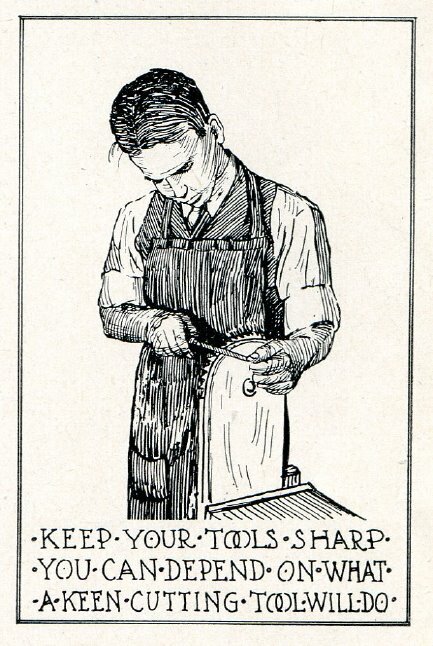 Keep your tools sharp, your mind also. Yesterday we went to the Downtown Aquarium in Denver and I was reminded of the old rule in fishing. One must be quiet, so as not to disturb the fish. That was not the rule in the Downtown Aquarium. Where children were not screaming, loud music was playing to increase the drama of the experience. Perhaps their fish are used to a particular noise level that would be distressing to fish in the wilds. But should children not be taught a reasonable behavior in wild places? And should quiet behaviors not be a requirement when we are given the opportunity to engage visually with wild things? On the plus side, the fish appeared healthy and there were hundreds of people at the Aquarium. On the unpleasing side, the experience of too many screaming children was not conducive to the kind of reverence that their displays deserve or that would have enhanced their exhibit for those more sensitive to such things. Children these days are suffering form Nature Deficit Disorder. They need to be engaged in learning about the world. Zoos and aquariums can play a role in that. Children also need to be taught to show respect for nature. 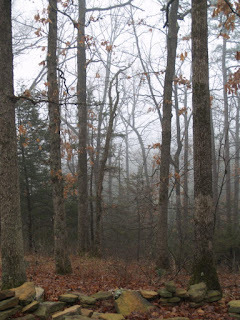 They need to learn to walk quietly through the forest so that they might learn from it. Children and adults also need to be taught how their everyday lives impact nature. Missing from the Downtown Aquarium was any sort of display of what the proliferation of single use plastics are doing to our oceans and our environment. To at least make a suggestion that children be taught by their parents to engage the exhibits with a sense of reverence, wonder, and respect would be an easy thing to do that would not even cut into profits. To suggest that visitors review and reconsider their use of plastics would also be a good thing. The Denver Downtown Aquarium is owned by Landry's Restaurants, Inc., a restaurant chain. It was purchased at a fire sale price after its founding non-profit declared bankruptcy during the financial collapse of 2008. I am in Denver visiting my wife's family and while I learned that Denver Schools have abandoned cursive, our great niece is studying it at home on her iPad. Is that enough? It would be a shame for American children to neither read nor write cursive. To put one's thoughts cleanly and efficiently on a page of paper is an admirable thing. In keyboarding you can type mindlessly and then go back and salvage something from what you've written. The same is not the case when you take a pen, dip it in ink and proceed to inform paper of your thoughts. The thoughts must actually come first, meaning that you have chosen in advance what to say, how to say it, and whether or not it is actually worth saying. In keyboarding, its the speed and accuracy that counts, not the meaning or the expression of humanity. 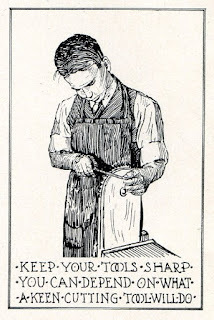 Woodworking philosopher David Pye considered writing with ink on paper to be an expression of craftsmanship of risk, in that you will certainly mess up if you've not practiced, or if you are not giving full attention to the process at hand. This contrasts with craftsmanship of certainty in which machines and devices provide perfect results despite the lack of skill, vision, creative insight of the operator. Perhaps human beings in general have become machine operators rather than what we once were. But I can understand why cursive has been abandoned in schools. As adults we rarely use it. Is that a good thing? Or we be more thoughtful if we practiced? I regard my box making class for adults to be an ideal learning environment. Students are encouraged to design their own work. 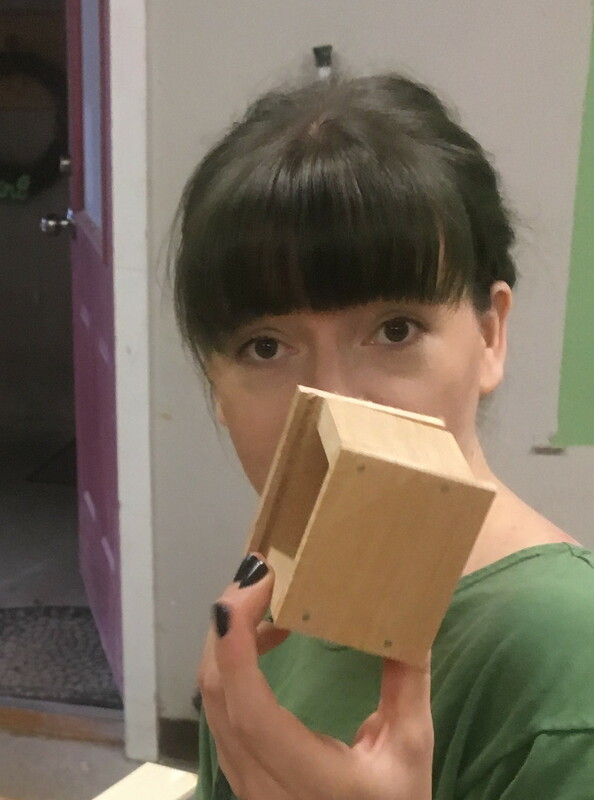 Students are taught the means to build a basic box. No specific requirements are preordained as to size, choice of materials, or design. Students get to make their own mistakes. I make some mistakes of my own (though not on purpose) showing that to make mistakes is human and forgivable. I bring a variety of boxes to serve as examples and to stimulate thoughts. Children are very effective at learning in part because they respond to error without being slowed by recrimination. They take also take risks without caring what other people might think. As quickly as possible, I give my students a variety of choices in joinery types, so that they are then distributed among a number of tool and processes and do not wait too long in line. I attempt to deliver instructions when we are all standing at the tool required, material in hand. I demonstrate, and offer the students the opportunity to ask questions about my techniques. Then I step out of the way so that students can try their own hands at the task. I remain available to coach students through their successful use of the tools and answer any questions that may come up. When things go awry, I am there to help the students assess. When things go right, I am there to compliment and congratulate. This might serve as an effective model in all educational environments from pre-K through university and beyond. The photo is from the Sloyd School at Nääs, where teachers came from around the world to learn to use woodworking as a means to extend Kindergarten style learning beyond the Kindergarten years, an ideal proposed by Uno Cygnaeus in his development of the Finnish Folk Schools.